In over eight years of making Pirates of the Caribbean films, Geoffrey Rush, who plays the wily and opportunistic pirate Hector Barbossa, has tracked the time in a unique fashion. "My kids have visited a number of sets during the filming of the various Pirates of the Caribbean movies," says Rush. "In fact, I've got a series of photographs from 2002 onwards from their various set visits. There are photos where they are up to my hips, then my chest, then my ears and no they're even taller than me. Barbossa always stays the same, but the children have grown up a lot." Barbossa hasn't stayed exactly the same over the years. Through four Pirates movies, he's been doomed by an Aztec curse, killed in a sword fight and resurrected with voodoo magic, He's sailed into a raging maelstrom, lost a leg to the infamous Blackbeard and even joined the British navy as a privateer. He's gone from being the outright villain of The Curse of the Black Pearl to becoming an antihero every bit as popular as Johnny Depp's Captain Jack Sparrow. Barbossa is such an indelible character it's sometimes easy to overlook Rush's other accomplishments. He's a classically trained Australian stage actor who's found great success in movies. He's been nominated for four Oscars (winning Best Actor for 1996's Shine) and won an Emmy for his 2004 portrayal of comedian Peter Sellers in The Life and Death of Peter Sellers. His diverse resume is not lost on his fans and Rush has no problem identifying where their preferences lie. He says, "If I'm out and about in public and someone makes eye contact, I can tell what movie they recognize me from. I can see them approach me and I think, 'This is going to be a House on Haunted Hill or a Pirates of the Caribbean moment.' You can pick the different demographics." The Pirates demographic has served him well. While not always popular with critics, the four films combined have raked in over $3.7 billion in worldwide box office. Quite a feat, considering pirate films in general were long considered dead in Hollywood. "The first (Pirates) film took everyone by surprise because there had been a 50-year period where nobody had been able to crack the pirate genre," says Rush. "People had tried to reboot it in many different forms, but it just didn't capture popular imagination." That all changed when Pirates of the Caribbean: The Curse of the Black Pearl became an instant surprise hit in 2003. Not bad for a pirate movie based on a Disney theme park ride. 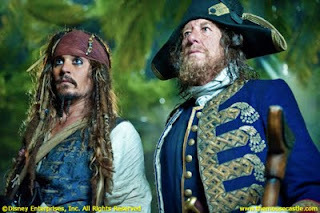 Says Rush, "At its heart, I think the great diversity of characters in the Pirates of the Caribbean franchise has been very appealing to audiences, especially with Johnny Depp's Jack Sparrow. Johnny created an entirely new and different pirate, and everybody fell in love with the character." Rush's Barbossa owes more to the style of Robert Newton's Long John Silver in Disney's Treasure Island, complete with his throaty vocal delivery and the occasional ARRRRR thrown in. Every day is Talk Like a Pirate Day when you play Barbossa. There's more to getting into the character than putting on a long coat and strapping on a peg leg, though. It takes a couple of hours in makeup for Rush to transform into Barbossa. He says, "You have to rough up the skin, stick on the beard, put on the wig--and then you put on his clothes once you're ready. You slowly build up to Barbossa, which is great for getting into character. However, I always feel that the hat completes everything. 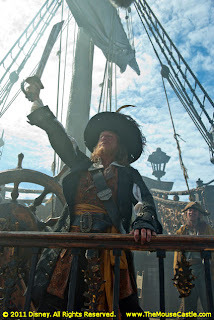 Once the hat goes on, I enter into the spirit of it and I truly become Barbossa." Pirates of the Caribbean: On Stranger Tides came out on home video this week. There's a pretty good chance Rush is already checking out the bonus features on it. "I love the bonus material you find on DVDs," he says. "In a funny way, the bloopers and the behind-the-scenes coverage is like a great personal home movie for me. Some actors like to photograph their experiences on a movie set. They take pictures of the friends and the mates they work with, but I never get around to it. However, I recently looked at the DVD bonus features for a movie called Elizabeth and it felt like I was watching a home movie of all of my friends. The DVD teams manage to record everything much better than I could. It's very professionally done, not like a hand-held camera." I bet Rush got some great shots of his kids that way. I'm glad to see more of Geoff when before it was always "Jack Sparrow" though I like Johnny as he's a great actor, but so is Geoffrey.